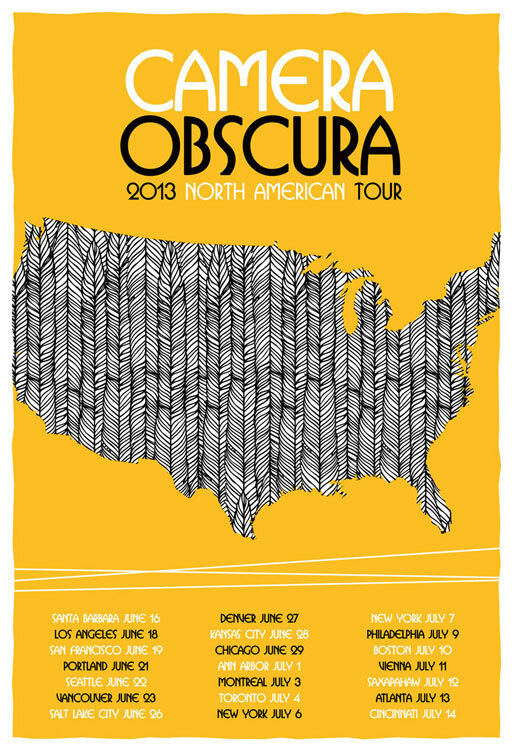 This design is the 2013 North American Tour Poster (we also designed their UK Tour poster), featuring an “On The Road” inspired view of summer tour travel. Inks, Edition, Size, & Paper – Inks: 2 colors from 2 screens with hand-mixed midnight black, and bright summer sun-yellow non-toxic water based silkscreen inks. Edition: Limited artist’s edition of just 50. Each print is hand signed and numbered by strawberryluna. Most of the portion of the run of this poster went on tour with Camera Obscura and we have just a very limited number of these posters for sale. Less than 50! Size: 16 x22 inches (45.7 cm x 61 cm). Paper: Archival, no-acid, recycled content, American made Cougar Opaque White, 100lb cover weight. 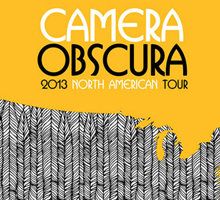 This design is the band’s 2013 North American Tour Poster. Hand silkscreen printed and available in their web shop here as well as in our webshop right here.